We’re starting a new feature where we shine a little spotlight on a local business! This month, we’re focusing on one of our suppliers of wine for the hotel, Del Rio Vineyards located in Gold Hill, OR. Back in 2009, our manager became a member of the wine club and quickly realized not only what a great product, but what great vineyard to recommend to guests of the hotel. After the Redwood received its Oregon Alcohol Servers permit, the wine became a favorite in our lounge. You can never go wrong with the classic “Rose Jolee” and a great one for around a fire with great friends is “Claret”. Next time you stay with us, remember to check out some of the other wines we offer by Del Rio Vineyard and ask about how this is included in your stay. The land the Del Rio Vineyard currently sits on has a fascinating history dating all the way back to the 1850’s and has been the site of a homestead, the Rock Point Hotel, and orchards. 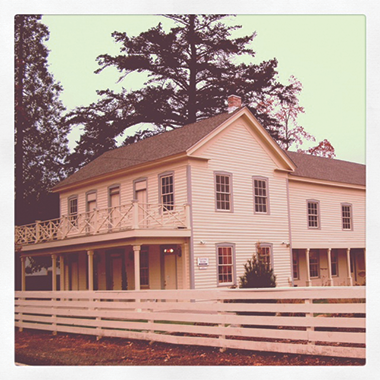 In fact, the Rock Point Hotel, which is still one of the oldest structures in Southern Oregon, has been partially renovated and serves as the tasting room. You can read more about the history on the Del Rio website. We definitely recommend a visit out to the Vineyard while you’re in the area. Open daily and located just off I-5 at exit 43. Relax in the Redwoods! Book your stay at the Redwood Hyperion Suites.